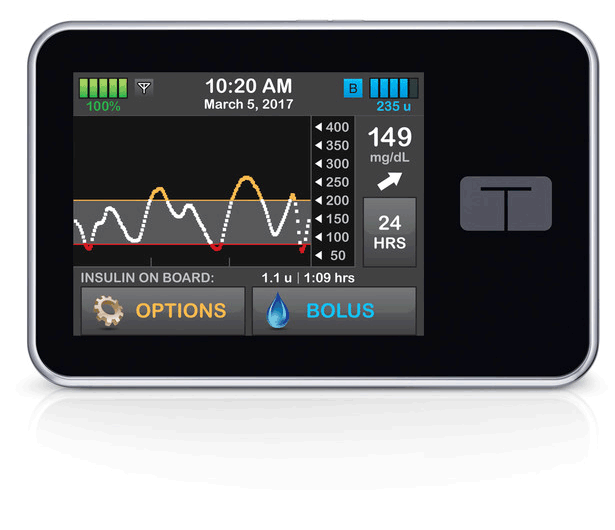 The t:slim X2 Insulin Pump is the next-generation colour touchscreen pump from Tandem Diabetes Care. It boasts an advanced Bluetooth radio, a durable aluminum housing, and is designed for remote software updates and the addition of new features. Now compatible with Dexcom G5 CGM! The simple-to-use t:slim X2 Insulin Pump is the smallest pump available, the only pump capable of remote feature updates, and the first CGM-enabled pump approved to let users make treatment decisions without pricking their finger.